We’re moved into our new house now and we’ve all been running ourselves ragged with house projects. The house is great, but it’s possible that we’ve bitten off a bit more than we can comfortably chew, especially considering how many toddlers we have. So between trying to fit a few fun summer things in, trying to get the reality of this house to match the version in my head and trying to keep my sanity with two-year old twins running around, I’ve decided I need a creative outlet. Namely, this blog. I’m not sure if you’ve noticed, but the postings have been a bit sparse lately. Then, the less I post, the more pressure I put on myself to make the next one really good. It better be an important topic or at least something really eye-catching. I better make it witty. I better make it poignant. But right now I’m scraping that kind of self-imposed pressure to be great and I’m just going to tell you stories of our trips and hopefully they’ll be a little bit important, a little bit eye-catching, a little bit witty and a little bit poignant. Or not; but hopefully you’ll like them anyway. I’m starting with a laundry room in Haarlem, Netherlands. Why? Well, because it was weird and it came up in a conversation last night over a few glasses of wine, and we all laughed when we remembered this particular laundry room and I thought you might laugh too. 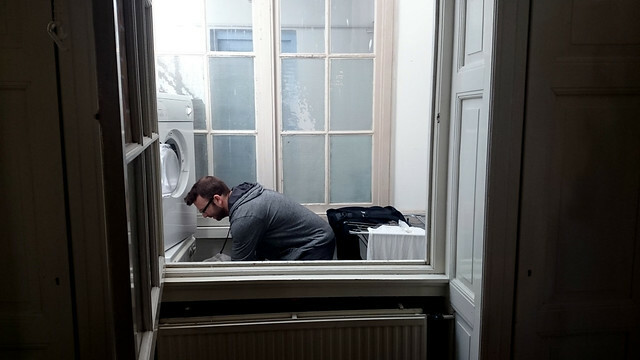 This particular laundry room was in a fancy apartment on a fancy street in a fancy town outside of Amsterdam. We stayed here at the end of our Europe trip last fall. The thing is, even fancy stuff has quirks. 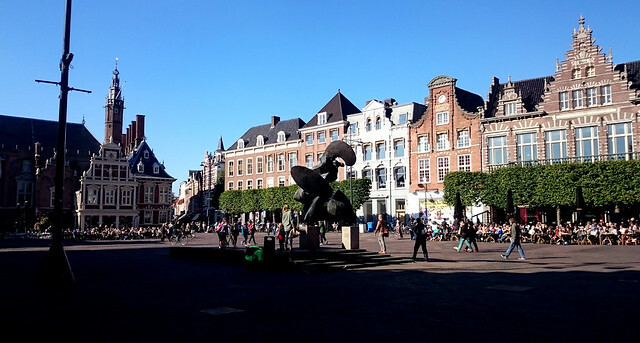 Europe in general seems pretty fancy compared to the United States but Europe is old and sometimes I forget that people who haven’t traveled much haven’t gotten to see the funny little things that happen when you take something so old and shove new technology into it. Like, for instance, washing machines. Notice how I have to open an enormous window to access the room and then, yes, I have to climb through the window. This wouldn’t work for someone elderly or with physical limitations. Then again, neither would these stairs which were also in the apartment. These stairs were hands down the steepest most treacherous stairs I’ve ever seen in any building. 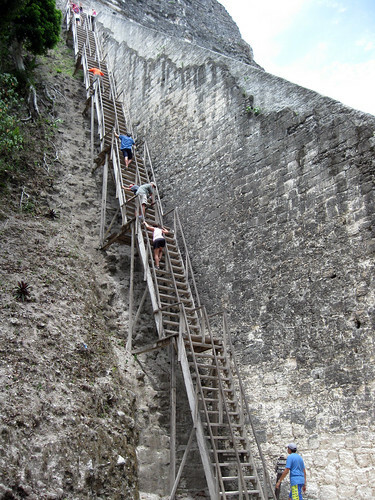 They were comparable to the ones we scaled in Tikal to climb ancient ruins. Also, I’m not joking when, in the video, I say that the laundry had been drying all day. Well, I guess a more literal statement would be that the laundry had been in the dryer all day. Saying it was actually drying might be a stretch since at the time this video was taken it had been going for hours and I did indeed need to put it on for another hour or so. This bathroom reminded me of a kitchen you might see where someone wanted a dishwasher but didn’t want to remodel and instead got one of those stand alone units. The dishwasher thing makes sense because kitchens were around long before dishwashers but toilets and bathrooms, to my knowledge, sort of were introduced at the same time. So why, I wonder, does this toilet seem like such a random afterthought? It’s a mystery. Another mystery in the apartment that did get solved eventually was the puzzle of the pull-out couch in the living room. Every pull-out couch I’ve ever seen in my life has unfolded pretty much one way. This one is the exception. After a lot of pushing and pulling every which way we finally got it figured out. So there it is, my very important, witty, poignant post about a quirky Dutch laundry room and a few other oddities. Talking about these things last night made us laugh, but like I said, we’d had a few glasses of wine so if you didn’t find them quite as fun, why don’t you go open a bottle of wijn (which is Dutch for wine) and then report back after you’ve read it again. What’s that you say? You think this post would be better wrapped up with a picture of me drinking wine while doing laundry in a foreign country. Okay, let’s see if I can dig one up. 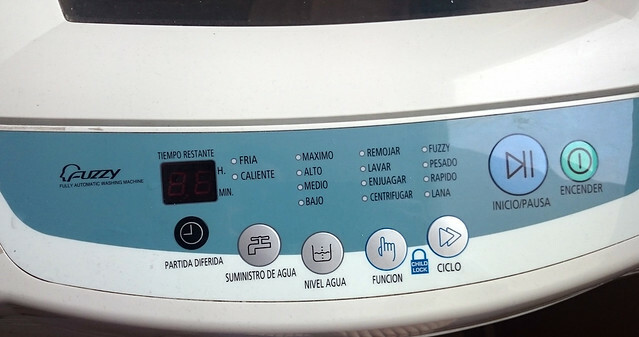 Here I am in Chile this last spring doing laundry and drinking wine. Thankfully I did not have climb through a window to access this one because it might have caused me to spill. Wine or no wine, my Spanish is abysmal so I just picked a random setting. I chose “fuzzy” because, why not? I love the quirks of traveling! Thanks for sharing.